I have now been to Goa three times. The first was way back in 2002 when we trekked with YHAI through Goa including Dudhsagar Waterfalls. That was the first trek for my two nephews. 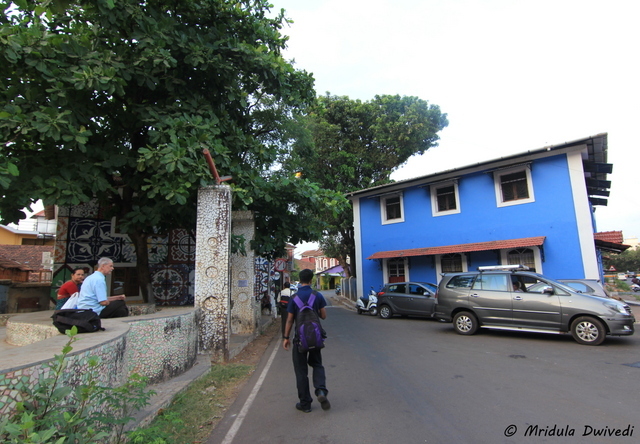 The second time I went in 2012, it was a college trip and we stayed in North Goa. 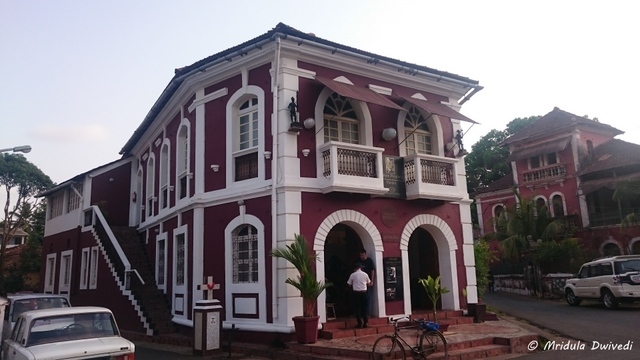 This third time I was there on invitation from Goa Tourism to attend the Goa’s Coconut and Cashew Festival 2015. 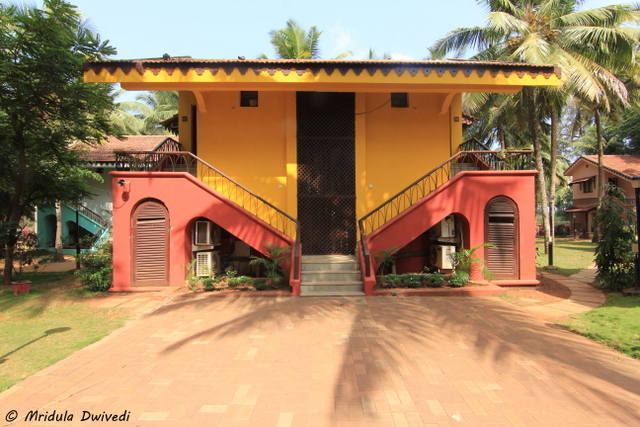 I wonder why I took me three trips to notice the beautiful houses of Goa but they were simply everywhere! It is a little difficult for me to imagine a house in purple and yellow! I don’t think I would like to live in a place with such a color combination. But then I guess it has got to do something with the character of the city as well! What I can’t imagine living in Gurgaon, looks beautiful in Goa! Our car was parked for a while in Campal as a member of our team wanted to go to an ATM. 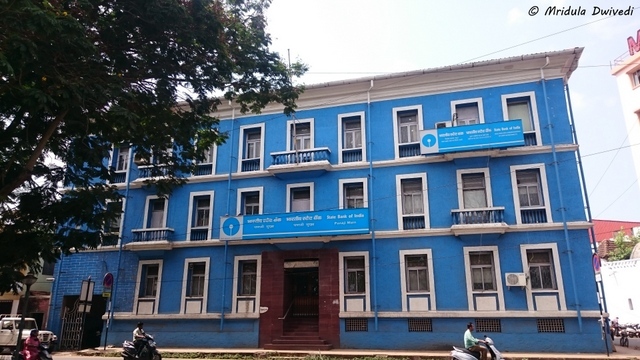 I ran out of the car to click a picture of the cutest State Bank of India (SBI) building I have ever seen. 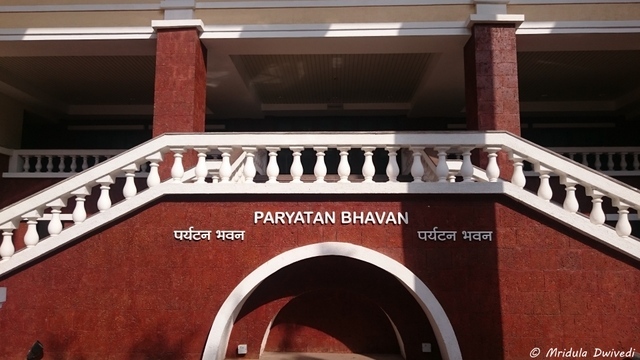 We went to the Paryatan Bhavan (Tourism House) to meet the MD of Goa Tourism Mr. Nikhil Desai. 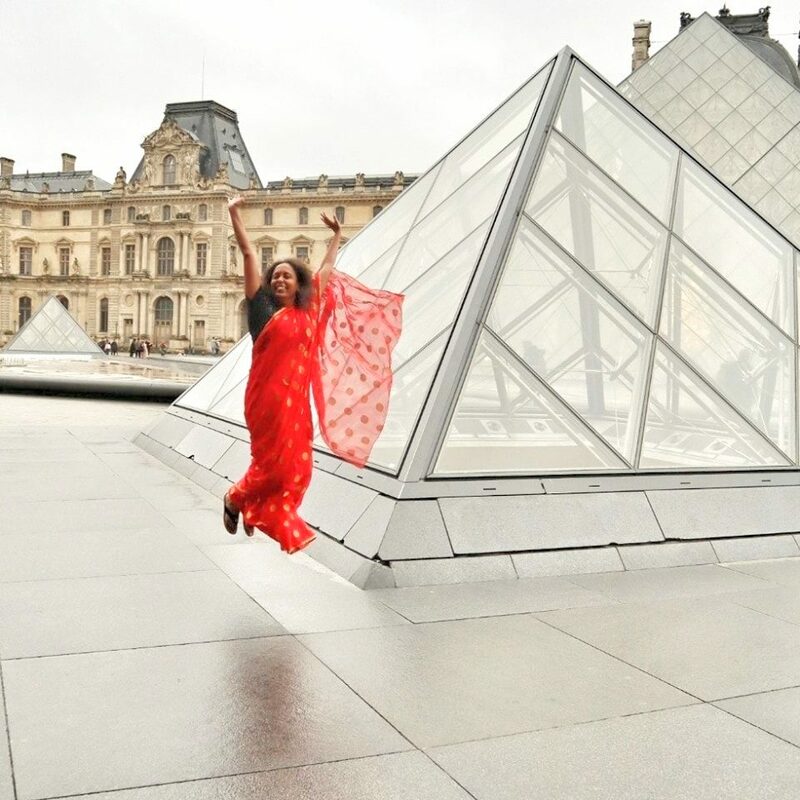 I was impressed right away, by the beautiful façade of the building! Our hotel, Miramar Residency had these cute little cottages right by the Miramar Beach. Each unit was a set of four independent rooms. It is a scenic place, set in middle of coconut trees and huge lawns. I only wish they maintained the rooms better! Velha was recommended to us by the MD for buying ceramics. As I am not much into shopping, after a while I walked out. 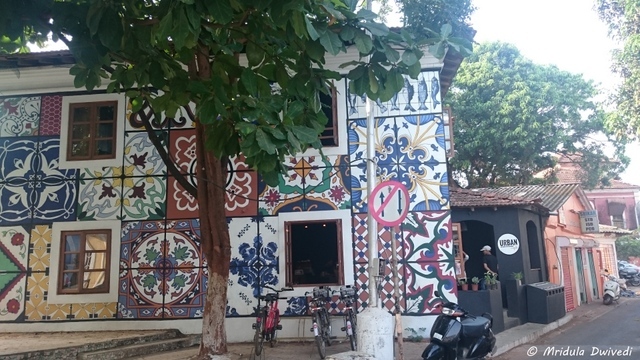 The Velha building itself is beautiful but it is surrounded by many more such beauties. Velha is in Fontainhas area. The area is worth checking out. 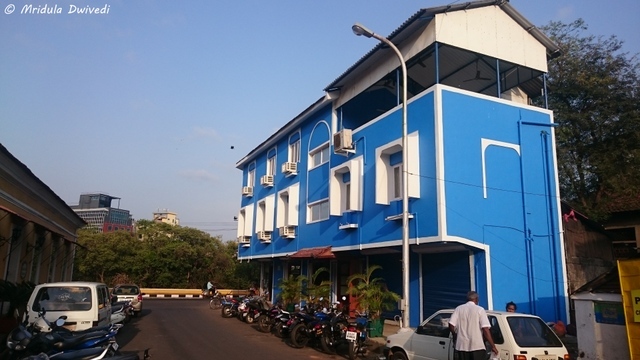 Right across Velha was this beautiful blue building. As far as I remember it was a hotel. We were quite smitten by the wall art at the Urban Café. Initially we were content to pass by it admiring it from outside. But after coming out of Velha we went to check it out. It was a cozy place which had good coffee and cakes. It had a free wi-fi as well. It was so soothing to the eyes to see the greens, people sitting by or moving at a less hectic pace than what I am used to. Of course, it had to have some more blue in it! The houses looked so pretty because they were amply mixed with beautiful trees. 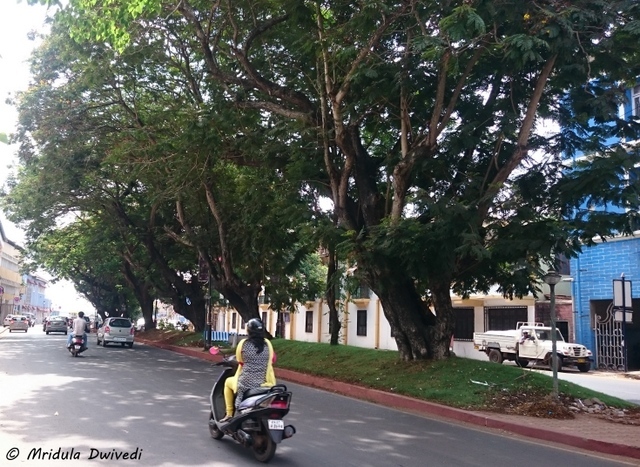 The green cover in Goa is amazing. I spotted these grand trees at Campal. 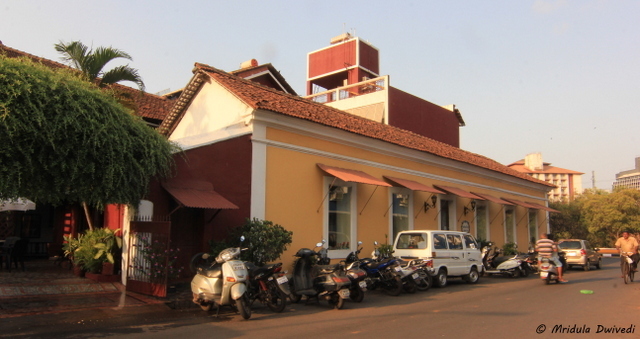 Another thing that impressed me in Goa was the quaint, cute cafes with a local flavor. Within a striking distance of Urban Café I spotted two more, each worth checking out but we simply didn’t had time. I wonder why I missed out on all the beautiful houses on my previous trips! Usually I am not that blind. But now that I have noticed them, I want to go back to Goa again! 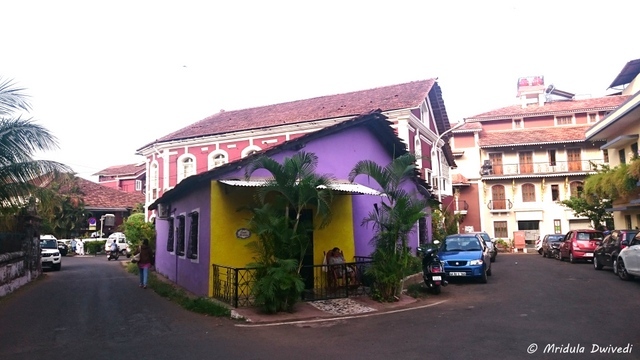 I wonder who I missed out on the beautiful Portuguese architecture influence on Goa homes.